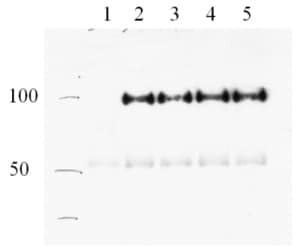 I am looking for a polyclonal antibody made by using the same immunogen as this ab6556 but using a different host species. Thank you for your enquiry. I can confirm that ab5450 (affinity purified) and ab5449 (crude) are exactly what you are looking for. 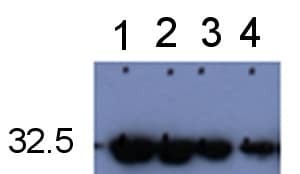 These antibodies were made in goat using the exact same antigen and they work just as well as ab6556 in all applications tested. I am trying to detect, by western blotting, a chimeric protein expressed in transgenic plants. The chimeric protein consists of green fluorescent protein (GFP) fused to the carboxy terminus of my protein. I am thinking about buying an anti-GFP antibody but I need to be sure that it will not cross-react with cyan fluorescent protein (CFP). Thank you for your enquiry. If your CFP is derived from the GFP of Aequorea victoria jellyfish, then I am afraid all our anti-GFP antibodies will cross-react with that protein, since the difference is a single amino-acid substitution and none of our anti-GFP antibodies are directed against that epitope. If your CFP is from another species, for example the reef coral Anemonia majano, then the antibodies will not cross-react. I hope this information helps, please do not hesitate to contact us if you need any more advice or information. Thank you for your interesting enquiry. I have had a look at the details for the immunogens on these antibodies and obtained some details for you. ab1218 is a mouse monoclonal which is been raised against a recombinant GFP fusion protein using amino acids 1-246 of GFP from jellyfish Aiquorea Victoria. It is reactive against all varients of this protein. Ab5449 is a goat polyclonal to the full length recombinant GFP protein (from Aiquorea Victoria) prepared in e coli. Its concentration is not available as this antibody is supplied as whole goat antiserum. Ab5450 is the same as Ab5449 but it has been affinipured. This means it is likely to be more specific and stronger binding to the immunogen. Its concentration is 0.5mg/ml. Does this antibody recognize EGFP as well? Yes, it is very likely it will detect EGFP as well.